The Triple Threat Trivia Trophy that was awarded to the winning team. Photo sent by Dora St. Martin. Every year, the Malden Public Library hosts its annual Triple Threat Trivia in order to fund the historic Converse Memorial Building. This year marked the 21st annual edition of the event. The event takes place at Anthony’s on Canal Street. A group of eight to ten players reserves a table to answer three rounds of trivia questions. In those three rounds, there are a total of fifteen questions consisting of subjects such as geography, history, pop culture and current events. At the end, the team with the most points wins the entire game and receives a trophy. Teams that showed up to the event dressed up in costumes and decorated their table received one bonus point. Mayor Gary Christenson and his MoTTTley Crew were crowned the “Best Dressed Table” coming as Minions and Gru from Despicable Me. Prior to the trivia, the participants were treated to a dinner. 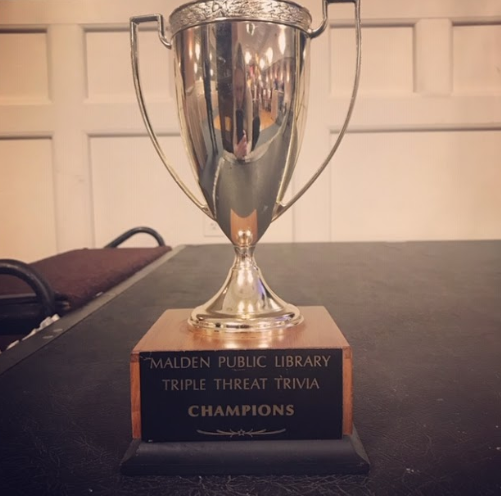 The Triple Threat Trivia tradition was created by former Board of Trustee President, Florence Burns, and former Malden Public Library Director, Dina Malgeri. Dora St. Martin, the current director, explained that that “they wanted a fun and creative way to bring the community together and provide support for the Malden Public Library’s historic Converse Memorial Building.” Having been constructed in 1885 and used for over a hundred years to serve the students and residents within the Malden community, it was extremely important to raise money to “support the continued maintenance of the historic building every year,” said St. Martin. Overall, St. Martin was impressed with the outcome of the event as they met their fundraising goal along. It was so successful in the sense that teams are already forming next year’s event. Not only did Mayor Christenson’s crew win “Best Dressed Table,” but they also won the entire trivia. Christenson recalled being “thrilled to win since there was such strong competition.” Last year, his team had also taken home the winning price, which made it all the more exciting.